Whether you think it’s ugly or awesome, you really gotta see this. 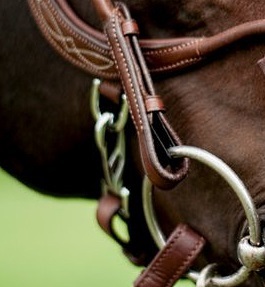 I have never in my life seen a bridle that was so meticulously designed. From top to bottom, it is definitely worthy of the term “engineered”. Gotta hand it to those Swedes. First let’s talk features, then I’ll give some opinions. Fair warning: all I had to take pictures with was my crappy old iPhone, which seems to think that the only place in my house with suitable lighting is the guest bathroom, so it looks a little shinier and darker here than it really is. I’ll have nice pictures by the time I post a full review. Crown: The crown looks really wide and padded, and well… it is. But it doesn’t swallow the head like I imagined it might. The padding is nice and thick and soft, I can see how the horse would find it very comfortable. The cutout design around the ears sits perfectly on Henry, you pull the bridle on and it settles nicely into place as if it was molded for his head. He’s got very sensitive skin and gets rubs even from his padded leather halter, so I personally am a fan of this feature. Browband: I was really skeptical of the “swoopy” design of the browband, but luckily it actually looks pretty good on Henry. The swoop isn’t very severe, and the way it sits on his forehead is very ergonomic… once it was on him I understood why they designed it that way. It also has snaps on both sides so that you can easily remove it. They sell lots of fancy browbands so in theory you could switch back and forth if you wanted. The snaps are very easy to fasten/unfasten but hold really well. Super cool feature, I’ve never seen anything like it. Cheeks/nose: The cheeks are curved and shaped to pass around the bones of the face. 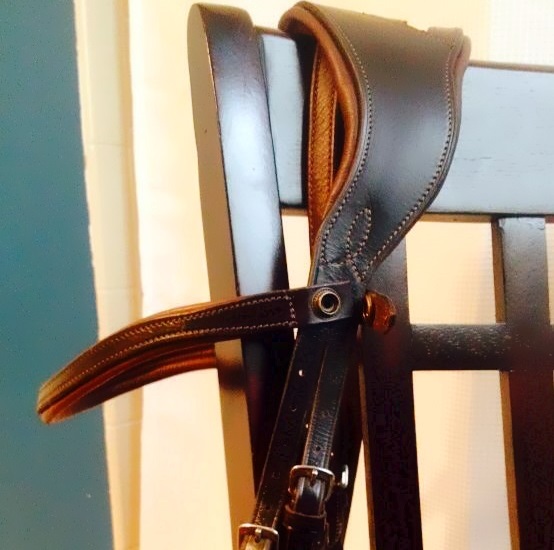 I love the fancy stitching and the padding, those details help give it the look and feel of a high dollar bridle. The noseband is the same general idea of the Micklem as far as not having any straps running over top of the teeth. The rolled parts and the flat part across the nose are easy to bend and mold to the horse’s particular nose shape. Noseband strap: This basically looks like your standard bottom strap from a crank noseband, except instead of “cranking” it has a metal snap on the side for easier and quicker on/off. If you don’t like the snap you can remove it. I like that there is a roller buckle and plenty of padding under the jaw. I did change some things around on this, configuration wise, which I’ll talk about in a minute. “Flash” strap: The strap that runs around the mouth under the bit is pretty straightforward. I really like that it buckles directly underneath the chin, instead of to one side or the other. It seems much less likely to pinch and also makes it a lot harder to over-tighten the flash. An interesting thing I noticed with the buckle here, as pictured above, is that instead of being sewn down like all the other buckles, this one has screws. Cheekpiece/rein elastic: This is a feature I wasn’t expecting, and I didn’t even notice it until I put a bit on the bridle. In the hook ends of the cheekpieces and the reins there are little elastic inserts… two layers of heavy duty elastic that are sewn and glued together. The bit nestles on the elastic. I pulled on it REALLY freakin hard before I realized what it was, so I have to say it seems sturdy. And yet again I find myself saying that I’ve never seen anything quite like this. They do say that you can easily cut the elastic strips out or have a saddler remove them if you don’t like them, but my initial impression is that on my very sensitive fussy horse I kinda liked the feel. It seemed a little bit softer. We’ll see as time goes on, but for now it stays. Reins: These are all of my favorite things rolled into one. They’re thin, they’re soft, they’re rubber lined, and they have stops. If you want GRIP, these are your reins. And since they’re so thin and soft, they feel really nice in your hands. No more bulky stiff rubber or web reins. Rein stops: My bridle came with regular leather rein stops but since I don’t use a running martingale on Henry and probably never will, I took them off. However, PS of Sweden did send me a free pair of their snap-on stops, which are awesome. I’ll keep these in my trunk just in case I ever do need them. Gone are the days of trying to pull those damn rubber stops over rubber reins or buckles. Snap on, snap off. And so much prettier than rubber. As far as design goes, this bridle hits it out of the park. For as cool as it looked online it’s way cooler in person. I got Cob size, which probably would not fit a horse any bigger than Henry… he’s on the lowest hole of the noseband. There were a couple things I changed around. First, the snap on the noseband was facing outward. I’m one of those people who cringes all the way to the depths of my soul when I see a full cheek bit without keepers, so it’s not much of a stretch to imagine that I just couldn’t let the snap stay facing out. My luck, the horse would rub it’s face on something and snap his face to it. So – I flipped it around to where the opening of the snap is facing inward, which I think is easier to fasten anyway. I also switched the whole chin strap around so that the snap is on the left, since that’s the side I bridle from. Also, the excess flap of leather on the noseband kinda got in the way of the cheekpiece a little when I was riding, so I took a keeper that was originally in the bottom middle of the chin strap and moved it to the end so that the flap would stay tucked as close to the face as possible. There are a couple of things I’m not 100% in love with, if I’m being really picky, but I’ll touch on those in the full review after I use it for a while. My first impression is that this is a really COOL bridle, very innovative and beautifully executed. Previous Eventers: XC boot input? So beautiful, Prisoner wants one! It’s very pretty and futuristic looking! I can’t wait to hear how it work out for you. having had my chance to fondle it, i can also say it was lurrrrvely. the reins and the crown/poll padding really sold me! It looks great on him! Certainly looks like a HUGE step up from the Micklem. 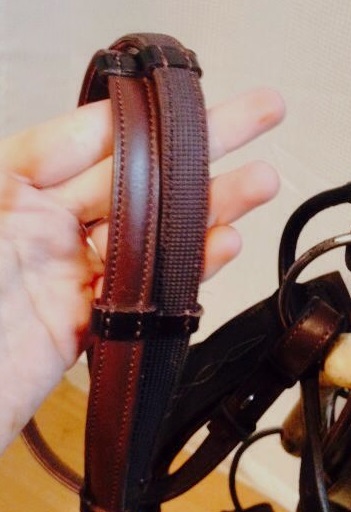 I love the fancy stitch details and the snap martingale stops and browband – that’s genius. Don’t think I could get over that giant crown piece though. Aesthetics wise I don’t love the giant crown, but functionality and comfort wise it’s fantastic, so that makes me a fan. And really it looks a lot better on the horse than I thought it would. 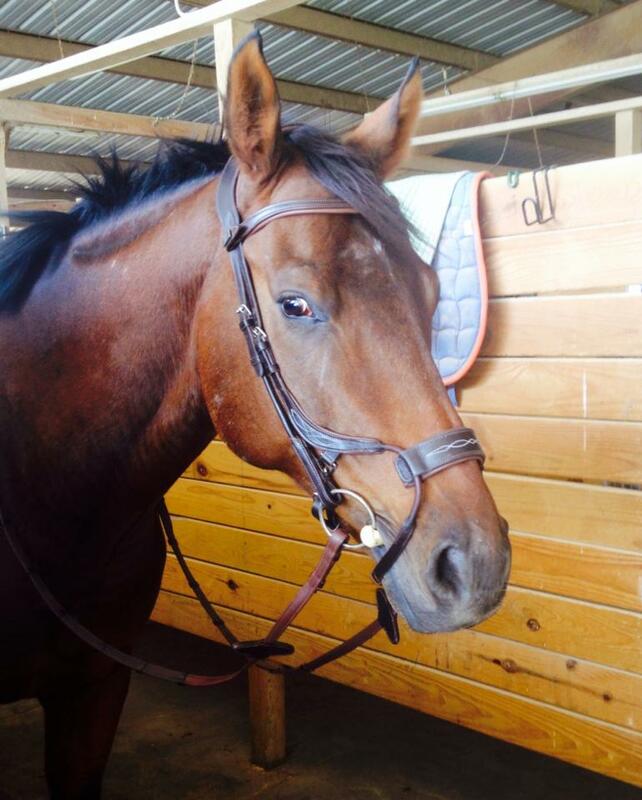 Nice bridle, looks really good on him! I’m really in love with those reins – we get a ton of rain and they look like they’d fit tiny hands! The reins are probably my favorite part… they’re brilliant. Wow, looks really cool! Deliberately designed AND pretty! 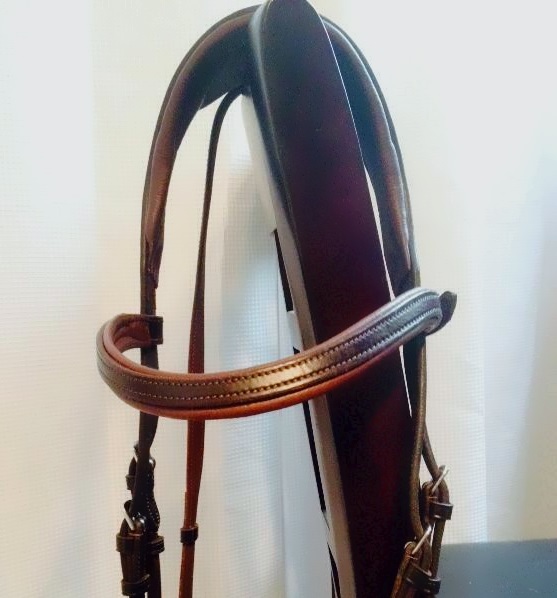 That is a super cool looking bridle- and I love that it has some of the same features as a Micklem, which I am also eyeing… will definitely be keeping an eye out for the full review! Also- is there a link to where you got the bridle? http://www.psofsweden.se/en/for-the-horse/ Prices include VAT, so take about 20% off what you see listed. I’m so definitely not a fan of any of their bridles, but I do admire that a lot of thought obviously went into them. I hope it works well on Henry! Very interesting design – thanks for sharing! I’m sure you know this, but just thought I would add since I was reading through their website in my post-surgery house-bound boredom. While the snaps on the browband do make it easy to remove, they also make it so you can snap on a throat strap so it’s dressage legal, at least in the dressage type bridle’s case. 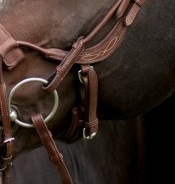 But I suppose you could add one on this bridle as well, just because. I personally love it. It is a super cool design and looks good! It’s not that expensive. A friend just paid $275 including shipping because the exchange rate has swung a bit more in our favor. 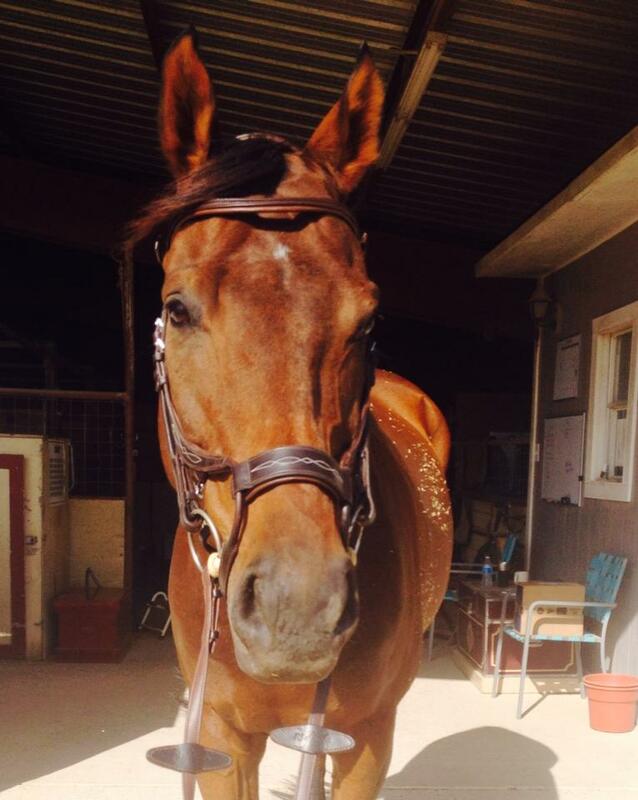 On the scale of bridle prices that’s not so bad, especially considering it comes with reins. But this particular model is not dressage legal, so that wouldn’t help you. I’m considering buying this bridle and have been looking to see if it is dressage legal. It appears Micklem-like enough that I thought it could be. Where did you find that it isn’t legal? Or has that changed since your review? Thanks!!! I asked USEF directly. It’s been 3 years now though, worth asking again. very interesting – it’s definitely a *different* bridle, but they clearly put a lot of thought (and presumably research) into the design and construction. it’s very beautiful! i’ll be curious to hear your thoughts after using it for awhile – particularly about the little bits of elastic at the bit attachments. enjoy! Wow it really is pretty to look at! And looks great on Henry! The elastic parts in the cheek pieces and reins is such a cool concept! 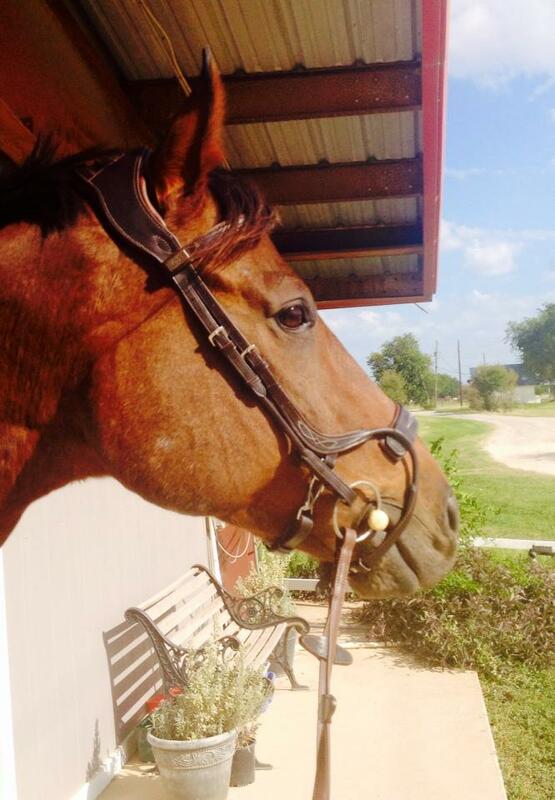 What’s the story on bridles not having throat latches? Seems like I’ve seen a couple videos of bridles coming off during competition if there is no throat latch or if it isn’t tightened enough. 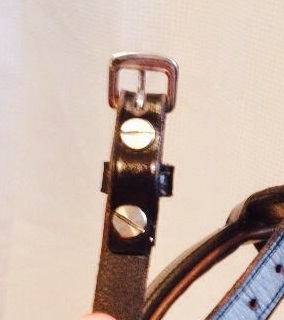 The bridles that have been coming off have had throatlatches that were adjusted correctly. Unless you get a throatlatch pretty tight, there’s not much it’s going to do for you if you going flying over the horse’s head and try to take the bridle with you. I think this style of bridle, that is so anatomic and fitted well to the head, is less likely to come off. 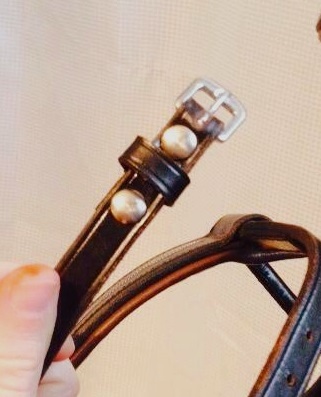 But PS of Sweden does sell a throatlatch attachment that snaps into the browband if you need/have to have one. All I can say is – want! I’m so wanting to buy this bridle, but still not entirely sure.. Thanks for a great preview though! Is this really worth the price? I’ve been wanting a high jump bridle but I just want confirmation from someone who has it who can justify the price. How’s it working out for you now? My favorite part (except that it solved our problem) is the reins, I really really love those reins! 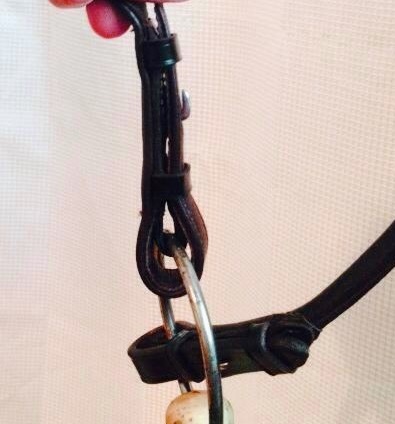 The bridle still comes with reins & you don’t have to buy them separately? Well, i bought mine through a local (Danish) webside, so I can’t say for sure, but mine came with reins, and would think it would be the same if you buy directly.